This review appeared on a Catalan website Vilaweb in 2013, but was recently and generously translated by my friend and colleague, Jan Hartman. Please note that there are one or two inaccuracies about me in the article, including the timing of my work on Iraq at the UNSC, which in fact concluded several months before the 2003 invasion. When the protagonist of this book was 12 years old they asked him what he wanted to be when he grew up. He said “ambassador, I want to be an ambassador when I grow up.” At 29 years of age the author, British, had been to Afghanistan and Germany in the service of the Queen. His work colleagues knew him by the nickname “Rottweiler” because he was so aggressive in negotiations. 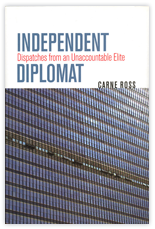 Mr. Carne Ross, a clear case of vocation, scaled up the diplomatic ladder, and was working at the UK Mission to the UN with the UNSC before he was even 40. By day he wrote reports, speeches, memorandums. By night he was a man who lived in New York, with plenty of money and single. You can imagine. While Carne Ross worked inside the UNSC the war in Iraq broke out. Then Carne Ross, the boy who wanted to be an ambassador, saw things that he had never seen before. In the morning he read reports from the UK intelligence service affirming that Saddam Hussein was no threat whatsoever. We did not need to worry about him. But in the afternoon, he had to write speeches that said exactly the opposite: Saddam Hussein was a real danger, he has WMDs and he needed to be brought down. Ross, as he himself admits, helped create an enormous lie about the famous WMDs. Based on that excuse, the war went ahead. But Ross was concerned about the consequences, and he was scared by the deal of thousands and thousands of Iraqi children. That was the tipping point. The young Rottweiler wished he has not been a part of that war and he decided to rebel. Ross wrote a book explaining the miseries of diplomacy from the inside, a book that the Foreign Office had to clear it before it could be published. 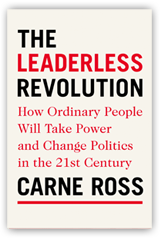 Then he wrote another book, The Leaderless Revolution, a lucid ray of hope, in people, in technology as a motor for change, just as had been demonstrated in the Arab springs. In his conversion Ross went even further and he became a member of Occupy Wall Street. In fact, he is part of an Occupy study group looking at alternatives to the current banking system. They have the help of a former Goldman Sachs Wall Streeter who also fell off his horse. In 2004 he created Independent Diplomat. This company advises countries and institutions that need international diplomatic help. Diplomacy is something Ross knows a lot about, so the company has done well with clients like the government of Kosovo, Somaliland, South Sudan, Western Sahara, etc. Thus Ross went from being a diplomat at the service of the imperial powers to a diplomat at the service of people seeking independence. And one has only to look at his Twitter feed to realize that Ross is a declared sympathizer with the Catalan cause. The day of the 25 November elections he posted two Tweets. The first, more analytical, “It seems that the pro-independence parties have done well in today’s elections The government will have to hold a referendum.” The second one he sent said, “It is a historic day for Catalonia, Spain and Europe: today is the beginning of the end of the nation states.” In one of his later Tweets he defended President Mas after a speech by Nadal. When Artur Mas went to Brussels to explain himself the audience asked him what friends he could count on. Who are the diplomats who are in favor of what you are proposing, Mr. Mas? One reply would be to say Carne Ross, the rebel diplomat.